Immigration Director-General (DG) Datuk Alias Ahmad: We’ll revoke 6,564 Passports of Malaysian abroad! The directive on the penalties is contained in the Fees (Passports and Visas) (Amendment) Order 2019 dated Dec 20, 2018. The order, which was published on the official website of the Attorney-General’s Chambers, was issued by chief secretary to the government Ismail Bakar. Among others, the order requires that individuals who want to replace lost or damaged passports (valid for five years) for the first time to pay a fine of RM400, while children under 12 years and students of the age of 21 years and below studying abroad will be fined RM300. For a second replacement, the same groups will be charged RM700 and RM600 respectively, and for a third, RM1,200 and RM1,100. Last year, the Immigration Department recommended that the government impose penalties for passport replacements, as the number of individuals losing the document due to negligence was high. Malaysia is ranked Joint 6th with Greece but there are 21 countries above Malaysia. PUTRAJAYA: Malaysian international passport is in the top six of most powerful passports in the world based on the 2018 Passport Index developed by global financial advisory firm, Arton Capital. The Passport Index is a reference point on all passports’ rankings based on the number of countries that can be visited by people of a country without requiring a visa, or with a visa-on-arrival. “Looking at history, Malaysian passport is the world’s first passport that is equipped with chip-based biometric security features,” he said in a statement here yesterday. Mustafar said the passport was further enhanced with additional security features to meet ICAO’s Document 9303 standards in 2013, while the chip was included in the biodata page in 2016. MALAYSIA’S passport is the sixth most powerful in the world, trumping developed countries such as Australia and New Zealand, according to Passport Index. The Index ranks national passports by the cross-border access they bring, assigns a “visa-free score” according to the number of countries a passport holder can visit visa-free or with visa on arrival. Malaysia was given a visa-free score of 154 and shared sixth place with Ireland, United States of America and Canada. For Malaysia, passport holders from 118 countries do not require a visa and visitors from 38 other countries require a visa-on arrival to enter Malaysia. Singapore tops the list as world’s most powerful passport with a visa-free score of 159. KUALA LUMPUR: The Malaysian passport is ranked as the fourth most powerful in the world by the Global Passport Power Rank 2017. But it loses some of its power when presented in New Zealand. Malaysian nationals or those holding Malaysian passports top the list of those refused visitor visa waiver in New Zealand since 2011. The reason: mainly because they were not considered genuine visitors, and that they were not there for the purpose stated in their documents. Of the 4,877 foreign nationals unable to enter New Zealand under the visa waiver programme since 2011, 517 were Malaysian passport holders, according to a report in the portal stuff.co.nz. More than a thousand people were refused visitor visas at the New Zealand border in the past year . Malaysians, it reported, were at the top of that list after being refused more than any other nation in the 50-country visa waiver programme. “Malaysians were refused over 100 times more than any other nationality,” it reported. Hong Kong was the second-highest with 412 refusals, followed by Australia (336), Great Britain (334) and Taiwan with 333. In 2012, in reporting that Malaysia had the most number of travellers turned away, the New Zealand Herald said those rejected included some carrying false passports from people-smuggling syndicates. “Malaysian Immigration says the country is being used as a transit point by syndicates which issue fake passports to help people to enter countries that have visa-free arrangements with Malaysia,” the report had said. However, the New Zealand Herald report did not identify the person in Malaysian Immigration who had said this. It is said that a stolen or lost Malaysian passport is worth between RM100,000 and RM250,000 in the black market. BEIJING: To date, a total of 192,402 Malaysian passports have been reported as stolen or missing, said Deputy Prime Minister Datuk Seri Dr Ahmad Zahid Hamidi. Zahid, who is also Home Minister, said this was according to Interpol’s Stolen and Lost Travel Documents database in Lyon, France. “A total of 76 million passports have been reported stolen or missing worldwide, and Malaysian passports constitute approximately 0.25 per cent of that number,” he told reporters at China World Hotel here, today. Zahid said a total of 52,459 Malaysian passports were reported stolen or missing from January to August this year. Zahid added that Malaysian passports were the seventh most popular in the world as its holders could travel to more than 150 countries without a visa. However, he said, stolen or lost passports that were listed in Interpol’s database would be blacklisted immediately. The proposed penalty is a RM200 fine for the first time, RM500 (second time) and RM1,000 for the third and subsequent times. The imposition of RM200 to RM1,000 penalty for the replacement of lost Malaysian passport due to deliberate negligence is implemented to educate the people to be more responsible citizens, said Immigration director-general, Mustafar Ali. He said the proposal for the penalty was well-received by the government, especially Deputy Prime Minister Ahmad Zahid Hamidi as this would teach people to be more responsible in taking care of this valuable document. “We can’t simply lose this important document and use carelessness as an excuse, so I had recommended for the penalty imposition and thankfully the government agreed to the proposal,” he told a press conference here today. He said those who lose their passports through calamities that could not be avoided such as theft, fire, flood or others were required to lodge a police report and the case would be investigated. The penalty for lost passport including a restriction on issuance for recurrent passport loss is expected to be implemented soon. On 16 June 2016, Immigration director-general Datuk Seri Sakib Kusmi denied a news report claiming that they were facing a serious shortage of new passports nationwide, with the several states supposedly being the hardest hit. Today, if you want a passport, you may have to join the long, long queues at the Passport office at Immigration. Line up at 5.30am and get a number. Why? Due to a serious shortage of new passports nationwide. KUALA LUMPUR, July 29 — Knowing the difficulty in applying or renewing their passports, many came to the Immigration offices as early as 5.30am yesterday. Some slept in their vehicles while others had packed food and drinks, hoping to get a number that would allow them to obtain a new passport. At the Home Ministry Complex at 5am yesterday, the crowd began to quickly increase and by 7.30am, a long queue was formed inside the complex. “I’ve been here since 5.30am and I have packed sandwiches and drinks as I may have to wait for several hours,” said Lim, who came from Rawang to renew his passport. He said he went to the Urban Transformation Centre in Sentul twice but was unable to obtain a number. Marketing executive Rizal Hashim, 42, said this was his fifth attempt over the past week. “I’ve been trying to renew my passport. I’ve even gone to Seremban and Kuala Selangor to get it done but they told me the system was down. It was the same thing at UTC Sentul and at the Immigration office in Kelana Jaya. PETALING JAYA, July 28 ― Malay Mail found frustrated, disappointed and desperate people waiting to renew or apply for passports in the Klang Valley yesterday. Here’s what some of those at the Kelana Jaya Immigration office and the Urban Transformation Centre (UTC) in Pudu Sentral had to say about the situation. Student Nurul Atiqah Noor Hamidy, 24, will be travelling to Ho Chi Minh City in Vietnam next week with her friends. “I went to the Kajang Immigration office at 9am but the numbers were finished and the officer told me to start queueing at 5.30am the next day. Nurul Atuqah said the queue numbers had finished between 7.30am and 8am and only 100 numbers were given out. PUTRAJAYA: The Immigration Department has given its assurance that there are enough passports to meet the demands of applicants. Immigration director-general Datuk Seri Sakib Kusmi denied a news report claiming that they are facing a serious shortage of new passports nationwide, with the several states supposedly being the hardest hit. “Since May 9, the department began issuing the new Polycarbonated Biodata Page with chip, and the implementation of the new version of the passport requires the offices to be closed. “The closure of the passport offices was never due to a shortage of passports, but due to equipment installation and training sessions to handle the machines to ensure a smooth flow of passport issuance. “To date, there 54 offices all over Malaysia using the new system except Pahang, Kelantan, Terengganu and Sabah, which are scheduled for deployment by next week. PUTRAJAYA: The Immigration Department will be upgrading its international passport issuing system with new safety features, in stages nationwide. As such, this will lead to delays in the issuance of international passports at some Immigration offices. Immigration director-general Datuk Seri Sakib Kusmi said they are already in the midst of upgrading works at all of its offices in Malaysia. “In line with the upgrading work, there will be some technical changes to the system. Lost your Malaysian Passport? From 1 February 2015, you must lodge a police report and bring the report to the Immigration Department if you wish to apply for another passport. KUALA LUMPUR, Feb 26 ― The Malaysian passport is 12th best in the world for travellers, based on the latest study showing the number of destinations its holders can visit without a visa. It shared the position with Liechtenstein and Slovenia, with access to 164 out of 218 countries in the Henley & Partners Visa Restrictions Index 2016, produced in collaboration with the International Air Transport Association. However, the Malaysian passport appears to be less popular this year compared to last year. It was booted out of its ninth position in 2015 while neighbouring Singapore successfully kept its fifth place for the third consecutive year, tying with Japan and Austria this year. The Singapore passport is accepted in 173 cities and countries worldwide this year, compared to 169 places last year. But Malaysia remains one of the top five Asian passports to be accepted worldwide this year, after Singapore, Japan and South Korea which came in sixth place with visa-free access to 172 destinations. PUTRAJAYA: An International Malaysian passport (PMA) which has been reported missing or stolen can no longer be used effective January 1, 2010 if recovered. Home Ministry secretary-general Datuk Alwi Ibrahim, in a statement today said, the ban was in order to avoid difficulties at international entry points. International Police (INTERPOL) records and regarded as no longer valid and could no longer be used to pass through international/border entry gates. Alwi said Malaysians should pay serious attention to this matter to avoid any difficulty and negative implications. “The step taken is aimed at ensuring the credibility and integrity of PMA and is not disputed by any quarter,” he said. 1. Your Malaysian passport is considered a “high-value” document as it allowed freedom to enter some 163 out of 219 countries without a visa. Thus, international crime syndicates prize it highly. 2. The Henley & Partners Visa Restrictions Index ranks your Malaysian passport at number 9 in 2014 in terms of freedom for its citizens to enter other countries. 4. All cases of missing Malaysian passports, whether at home or abroad, must be reported to the nearest police station beginning 1 February 2015. 5. If you have lost your passport, to apply for replacement passports you must present a police report to the Immigration Department. 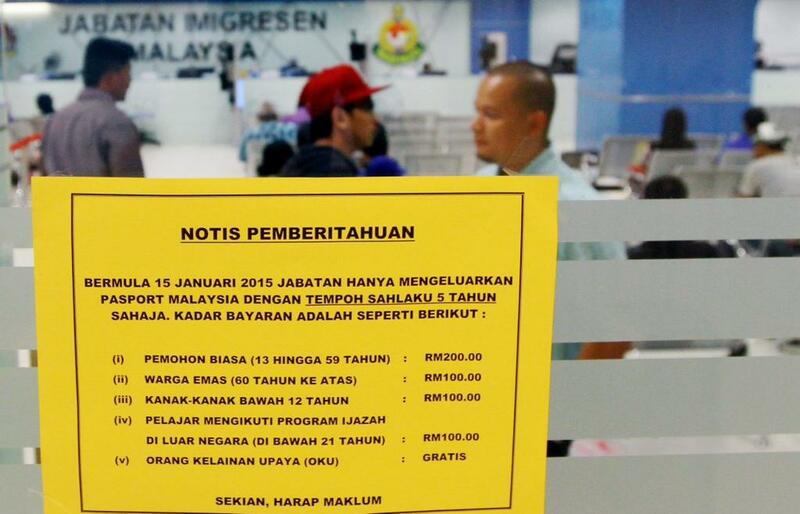 Passport fee reduced to RM200. This entry was posted in malaysia, malaysian passport, missing passport and police report and tagged malaysia, malaysia passport, missing passport, police report required for replacement of lost passport. Bookmark the permalink. Do you know how long it takes to process the lost passport? I’m flying next Tuesday.. unfortunately. UTC: police report, go to Immigration. One day? Do i need to go to UTC or can I just directly go to the immigration in putrajaya? Whoever is nearer. But must have a police report. Hi there! I just lost my passport and will be making my police report the following day. Does it really take a day for the passport to be replaced? Sorry, I’d like to make sure. Thanks in advance for the reply. If you go early in the morning, your passport should be ready by noon; if you go in the afternoon, you should get in by 4 pm. Thank you for your reply! I’ll be sure to get there early. GO TO THE UTC Perak if you live in Ipoh. At the Passport office, every counter has this: a camera. No worry about not having photos. They will take your photo at no extra charge. 2. At the jabatan imigresen, go to the lost/missing passport. There you will be asked to fill in two forms – application form and investigation form where you will be asked to provide the fine details on how you lost your passport and the effort you spent looking for it. 3. You will be required to go to a Commisioner of Oath to get him to sign off the investigation form. 4. Before submitting your forms, prepare 2 photocopies of your ic, 2 passport photos (the imigresen officer will not take your photo at the lost/missing passport section, you have to provide 2 hard copies of your photos) and a copy of your missing passport. It’s important to keep the details of your missing passport to expedite the process. 5. Submit the forms, photos and photocopies and you will have to wait 5 working days before they issue you with replacement passport. Planning to visit Jabatan Imigresen Malaysia-Kompleks KDN Jalan Duta by next week. Is there where you replace your passport? I have read through step 1-5. I lost my passport in KL, which is where I live. I filed my report at the Kelana Jaya Immigration Office but the process should be the same in the Jalan Duta branch. Take heart that the officers in the Jalan Duta office are very efficient. The reason why I had to go to Kelana Jaya is because it was a Public Holiday for KL and I was desperate to get my passport problems sorted out. Yes, everything can be done in one day. Be sure to make a police report first (this is extremely important and make sure that the head of the police branch stamps on the report). Also, get 2 passport photos and 2 copies of your missing passport (if you have it) ready. Then get your forms from the officer and fill it in properly. Here’s a note, ever ever use a white fluid correction pen on your forms – if you use it on your forms, they’ll be rejected (I had to fill in my forms twice because of this). Then go to the Commissioner of Oath to get him to sign and stamp on your form. There’s a Commisioner of Oath in the Jalan Duta centre, so there’ll be no hassle of travelling around to find one. Here’s the part I didn’t make clear in my earlier post: Although the officer told me that I should call the Immigration office in 5 working days to check the status of my replacement passport application, it’s not exactly a guarantee that I would get a new passport in 5 days. I will have to make a call next Wednesday to find out and I’m hoping that I’ll get it soon before I fly off to Shanghai by the end of this month (I’m crossing my fingers every day). Good luck SP and hope the info is helpful! Just in case, bring along any documents ( example – booked air ticket, reserved hotel ) to prove that you need the replacement passport urgently. Unfortunately I didn’t have any of those documents. If you have them, just take them with you. All the best! Hello there! Latest update. I’m happy to report that I got my replacement passport after 6 working days!